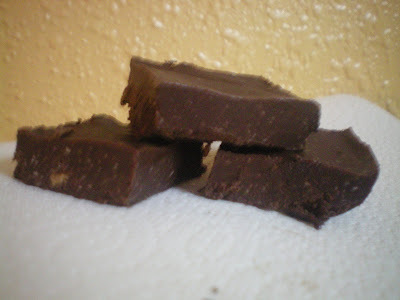 I know paleo fudge is kind of a oxymoron. But while most fudge is made with tons of powdered sugar this one is sweetened with only honey. It's super delicious! Place all the ingredients in a bowl and mix well. Line an 11x7 inch baking pan with parchment or wax paper. Pour the mixture onto the paper and spread evenly across the pan. Put into the refrigerator for 2-3 hours or until it has become solid. Slice into one inch squares and enjoy! Store in the refrigerator. YUM! This is very similar to the coconut carob fudge in The Maker's Diet book (that I make fairly often) in ingredients and procedure. The ratios are a bit different with coconut oil and nut butter, though the honey looks the same. I'll definitely give this one a try--your recipe, which uses about half the coconut oil of the other recipe would be a little less expensive too, which is always good! Oh my. This looks and sounds absolutely amazing. Thank you so much! I am just thrilled to have found your site. I keep finding post after post that makes me smile from ear to ear. Please know that your words are touching the lives of many. Thank you! This looks so amazing. I just went on the South Beach Diet, and I wonder if I can make this in the next phase. (You are not supposed to have any sugar in phase 1, but I'm using some agave. I don't do fake sugars). Do you think you could substitute the honey with agave? Tmuffun- I not really famillar with agave, never used it myslef, but I think it would work for the honey. Let me know how it goes if you try it! Thanks for the info about agave. I don't use it myself and was thinking I heard it wasn't good but I couldn't remember why. Thanks for the reminder. Delicious! I made a version of it adding in some hot pepper infused sea salt and espresso grounds - thanks so much for sharing! Are the coconut flakes necessary to achieve an appropriate consistency, or are they just for flavor? This looks delicious, though I'm not a huge coconut fan. Adrienne Girya Girl- Your version sounds awesome, I will have to try it that way! Cavewoman- I made it once without the coconut flakes and it was ok but I prefer the texture with the flakes. You may like though- give it a try! What kind of nuts do you use for the nut butter? I'm assuming you use nut butter with no sugar? How many calories would be in this one serving? Tell me about the coconut. Do I buy a coconut, shred it, dry it and use half of that? Please tell me no. Could I just buy a package and use how much? factory, leaking underground tanks - Non point source: delivers pollutants indirectly through or environmental change. On the other hand, centralized systems are noticed to be expensive in the long run. Major challenges identified are entry barriers, rapidly increasing sludge, water pricing mechanism and increasing electricity consumption in wastewater treatment plants.